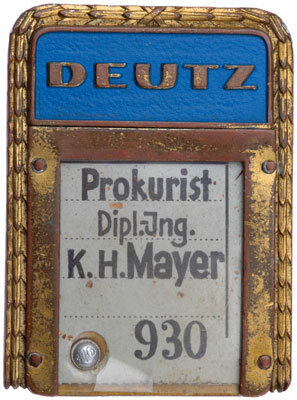 Deutz Lawyer ID Badge: cupal (copper clad aluminum), tombac plated, 60x44 mm, riveted ID frame, KHD aluminum security rivet, blue painted background for the company name, white plastic name tag with clear celluloid window, serial number 930, needs more research to date the badge, my estimate is Third Reich era because it is a vet pickup. Super quality, overall moderate wear. Deutz AG is a German engine manufacturer. The company was founded in 1848 as N. A. Otto & Cie by Nikolaus Otto, inventor of the four-stroke internal combustion engine. Other famous names who worked for Deutz in the past are Eugen Langen, Gottlieb Daimler, Wilhelm Maybach, Prosper L'Orange and Ettore Bugatti. In the early years, neither Otto nor his partner, lawyer Eugen Langen, were interested in automobiles, only stationary engines. In the middle 1870s, technical director Gottlieb Daimler, agitating for production of automobiles, was transferred to the company's St. Petersburg factory to reduce his influence. He resigned, taking Wilhelm Maybach with him. Deutz once also produced agricultural machines like combines and tractors as well as commercial vehicles such as lorries and buses. 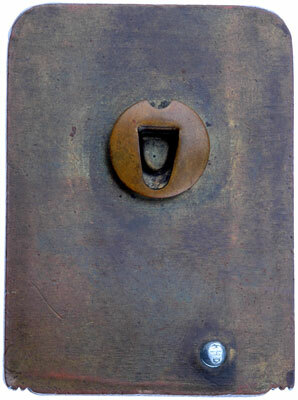 During World War II, the company was ordered to produce artillery and operated under the name Klöckner Humbolt Deutz AG.